Krishna Janmashtami also known as Krishnashtami, is a Hindu festival, commemorating the birth of Lord Krishna. This day is not just about offering prayers and fasting; it has some special activities associated with the celebrations. Janmashtami is the day Bal Krishna is worshipped or Krishna in his infant form is worshipped. A naughty baby who would exasperate his mother no end, Krishna has been a charmer since childhood and known to win the hearts of everyone he meets. Here are some ways to help you celebrate this Krishna Janmashtami at home, in your society or at school. The verses in the Bhagavad-Gita (The Hindu sacred book, narrated by Lord Vishnu) say, that whenever there will be a predominance of evil and decline of religion, Vishnu will reincarnate to kill the evil and save the good. The main significance of Janmashtami is to encourage goodwill and to discourage bad will. While the Lord wears many ornaments, his constant accessory is a peacock feather in his hair. Have you ever wondered why Lord Krishna wears a peacock feather? Story goes that Krishna played his flute and the peacocks were so mesmerized that with large tears of ecstasy, the king of peacocks dropped many divine feathers at Krishna’s feet. Krishna lovingly accepted the offering of the peacocks and picked up the feathers and to everybody’s joy, placed a few of them on his turban. Thus he came to wear the peacock feathers. Click on image to learn how to make this Paper Crown. Lord Krishna, in his infant form loved eating butter and would gather his friends to steal the butter from the handi. They would make small pyramids to reach the dahi handi hung at greater heights and then enjoy eating the tasty butter made by their mother. This is the real story behind celebrating Dahi Handi, which depicts the mischievous acts of Lord Krishna. Decorate a Mud pot with painted paper feathers.. Draw a Rangoli & make tiny Krishna footsteps leading to your house .. Typically we use rice flour & water mixture for this.. not too runny, not too thick. make the toe prints using finger tips. Its considered auspicious to have krishna’s footsteps leading to your house and is said to bring lots of happiness. The word ‘jhanki’ means to look into the past. Hence, Janmashtami jhankis are arranged on the different themes relating to the past life of the Lord Krishna, his childhood, boyhood, his raas leela and other incidents of his life. The most important arrangement for Janmashtami celebration is that of baby Krishna. Hence, special stress is given on jhankis showing scenes from Lord Krishna’s childhood. Besides, devotees also make beautiful ‘jhulans’ or cradles for the baby Bal Gopal. During childhood, Lord Krishna would often steal butter that ‘Gopies’ would prepare. After this incident, Krishna was given the name – Makhan Chor. Tie a small earthen pot with buttermilk in the middle of the room. 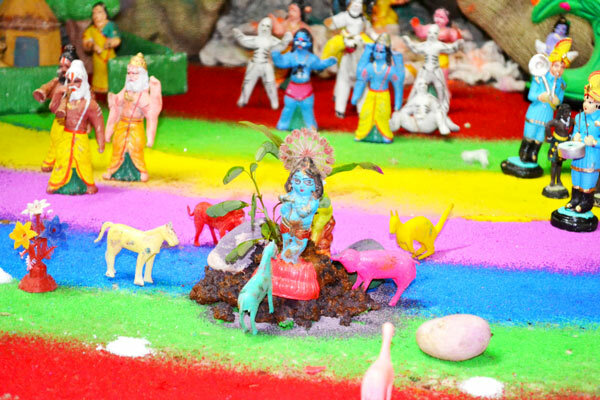 Get the kids blindfolded and have them break this miniature Dahi Handi. For minimum mess, you could also fill it up with sweets instead of buttermilk. No Krishna costume is complete without a flute or bansuri. You can buy a decorated flute as part of the costume or get a plain one and decorate it using silver/ golden ribbons, Shiny Washi tape or gota and embellishments. A visit to ISKCON temple, if they’re in your city must be on your list on Janmashtami. 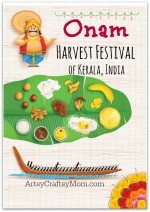 There are special celebrations, shows and activities on this day in the temple which can truly invigorate your senses. The Chants, the songs and special Pujas will make it a learning experience. Anushka’s favourite story was this one, where lovable Krishna Bhagwan dons a teenage avatar yearning for his first plane journey but is stopped by an earnest security guard. 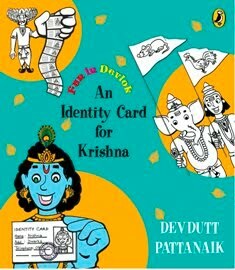 Krishna’s aged devotee, tells Krishna the story of Anasuya and the Ashwini twins, and why Rishi Chavan made a rule that all gods should carry a flag with their symbol- sort of like the ancient form of an ID!! 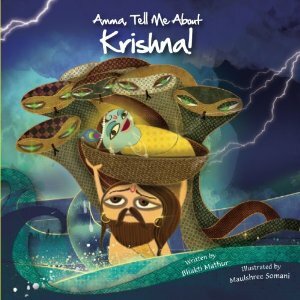 Vani Balram also sent us details about a fav book in their household ..
Amma, tell me about Krishna. 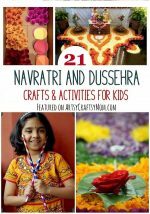 She says its a great fun way to introduce Hindu mythology to little ones. Her son loves Vishnu . 14. Make Sweets & Savories with your kids. Each kit contains the paper cutouts and the material required to complete the activity along with the instruction sheet to help the children.The children will enjoy making and can be used by them for story telling or fun. This book contains coloring pages, Krishna Shloka with meaning and 2 stories. I found these adorable Krishna & Radha on a Facebook Page – https://www.facebook.com/MyLittleGopi/ . Do check out all the dolls. 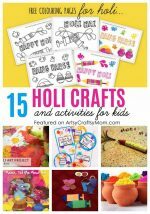 Download Free printable Baby Krishna coloring pages for kids of all ages. You can print or download them to color and offer them to your family and friends. The coloring pages will help your child to focus on details while being relaxed and comfortable. The ways to celebrate Janmashtami with children are several, all of them rewarding. Bring magic home this year by going the extra mile and celebrating Krishna Janmashtami in a fun way with kids. Festivals are terrific in how they bring the family together. Plus, everyone’s doubly happy when the little Baal Gopal or Radha of the house is pleased! « Cuemath Pythagoras Fest – Celebrate Freedom from the Fear of Math! 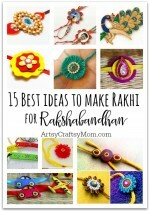 Hey thank you so much Shruti for featuring my post…Gosh! I took this picture when I didn’t know how to handle a dslr camera 😉 but have updated it with some new images….thanks again..& Happy Krisna Janmashtami. Love the ideas Shruti. The pot and the crown… Lovely. Went and visited Priti’s breathtaking post too. Thanks for featuring such interesting stuff. 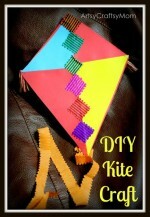 Hey, you just wirte an amazing post, this will help me out for making this janmashtami more creative. Happy Krishna Janmashtami . 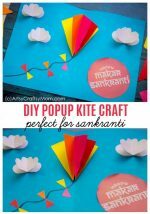 You have shared the really amazing post with us these will help us to do activities and craft on the festival of Lord Krishna’s birthday.